In a large bowl, combine all the ingredients and stir till the dough starts to leave the sides of the bowl. Transfer the dough to a lightly greased surface, oil your hands, and knead it for 6 to 8 minutes, or until it becomes smooth. Alternatively, knead it in a KitchenAid type machine (I did that for about 7 minutes at speed 2). Transfer the dough to a lightly greased bowl or large measuring cup, cover it, and allow the dough to rise till puffy though not necessarily doubled in bulk, about 1 to 2 hours (mine doubled in a little over 1 hour). Transfer the dough to a lightly oiled surface, and shape it into a loaf. Place it in a lightly greased 8 1/2″ x 4 1/2″ loaf pan, cover the pan loosely with lightly greased plastic wrap, and allow the bread to rise for about 1 to 2 hours, or till the center has crowned about 1″ above the rim of the pan (mine took only 1 hour to reach that point). Towards the end of rising time, heat your oven to 350F. Remove the bread from the oven, and turn it out of the pan on a rack to cool. If desired, rub the crust with a stick of butter; this will yield a soft, flavorful crust (I omitted this step). Cool completely before slicing. Comments: The variable amount of water given in the recipe accommodates for differences in humidity and temperature in each kitchen. Start with 8 ounces and see how the dough behaves. It is very important not to add too much flour, or it will be too heavy. I just love your active photo with the dough and then the bread rising, very creative! Thank you! I am always so glad to see the bread rising, that I cannot resist snapping a few photos..
I’ve not had much luck with making whole wheat bread without it being too heavy and the crumb being too dense. There are so many variables to consider, of course – weather/temperature, humidity, altitude, oven temperature, type of oven, type of flour, good enough yeast, proper water temperature, amount of kneading (too much? too little? )….my loaves could have any of these ‘issues’ – or maybe more than one culprit causing the heaviness. While I enjoy the experimentation, and of course, the whole experience that is baking my own bread, I wish my loaves would come out decent on a more consistent and frequent basis than they have done. Oh! And I agree – I love the ‘live’ photo shots you’ve incorporated into this post. Cool, and yes – very creative – and fun. Thanks for sharing this. Like you, I also rarely make bread just using whole wheat alone. I think you convince me on this one. Sally, quando vi esta postagem, não tive duvidas que queria muito fazer, assim como a grande maioria nunca tive muito sucesso com 100% rye,. …mas em se tratando de promessa de rei e vc nos mostra excelentes resultados terei que fazer o teste urgente. Glad to see someone else baking bread in their Breville oven. I have the Breville and the Hamilton Beach rotisserie ovens and use both. My only problem with the Breville is trying to bake bread that calls for a separate pan with water to use as steam and the fact that it is not higher inside. It is just to low in height to hold a La Cloche. I use the Hamilton Beach to do these two things and it also works very well. Both are really good products. I have had very good luck with my latest project in the Breville, a sourdough using a preferment and a mix of 5% rye, 20% whole wheat and 75% bread flour. Makes a great loaf with a lot of flavor and not too sour. Thanks for baking this. 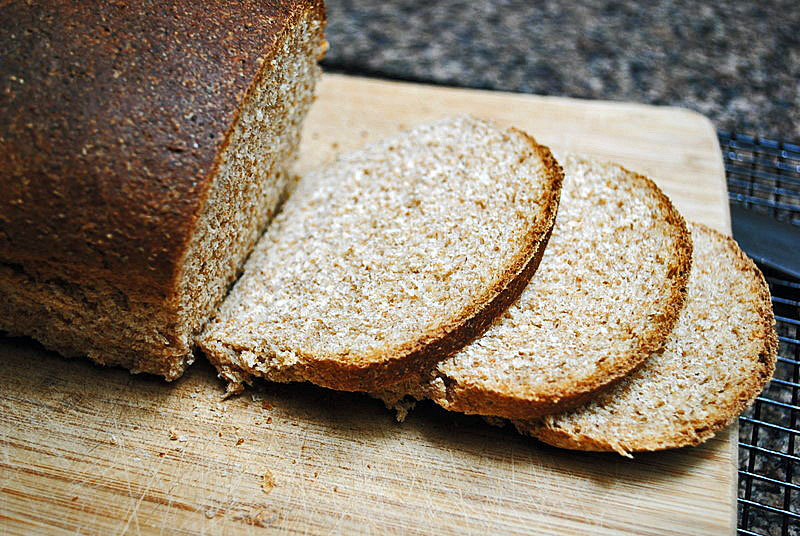 I wanted this bread so badly when I saw it on their site, but I don’t have powdered milk. I forgot about it. Now that you reminded me about it, I’m going to run out and get some powdered milk or else figure out how much liquid milk to sub out for water. Your bread looks that good! I have to have some!